Most eCommerce businesses make use of social media, email marketing, YouTube videos and digital advertising to market their products in their target segment. But after a point, all their efforts and campaigns start to look repetitive. And anything repetitive on the internet in today’s fast moving generation, isn’t interacted or engaged with by most. So how does an eCommerce business change the rules of the game? By making use of referral marketing. In our previous post, we spoke of how eCommerce businesses can boost their sales using referral marketing. 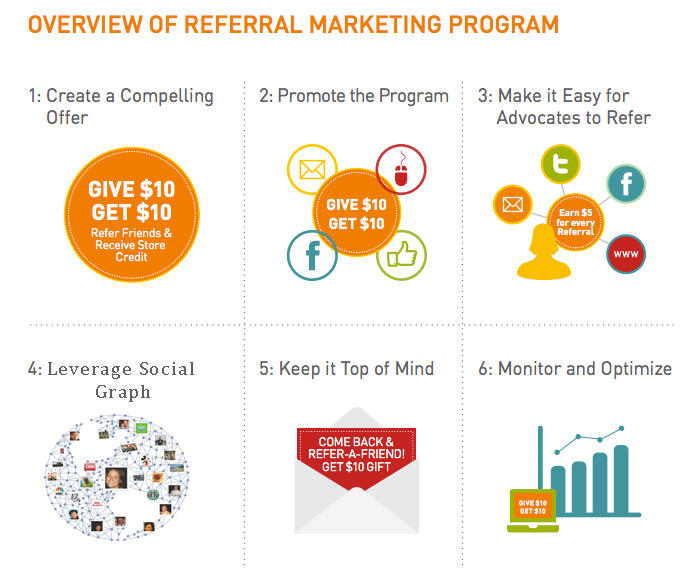 In this post, we’ll look at the main pillars of a referral campaign for any business. It is the method of promoting products or services to new customers via word-of-mouth (existing customer referrals). While referrals are something that often come in on their own once the business has established a market for itself, they can also be triggered by appropriate strategies. People tend to trust other people’s reviews before engaging with a new business. It makes them feel that if a product offered by the business is benefitting someone like them, it is more likely to suit their needs as well. As a matter of fact, according Harvard Business Review, referral marketing is ranked as one of the highest ROI generating marketing activities a business can invest in. Another thing that referral marketing ensures is that your referred customers are usually high-quality (target specific) and sales ready. And the acquisition doesn’t cost you as much as running ad campaigns does – you only end up rewarding for the achieved referrals. What should you monitor when running a referral campaign? Unlike other digital marketing efforts, you won’t get instant results from a referral marketing campaign. Based on the industry you are in, the kind of people you are targeting and the referral offer, the results may vary from one eCommerce business to another. The participation rate is defined as the number of people who are willing to become your brand advocates on social channels. These could either be your existing customers or new customers, based on what the referral campaign has to offer. How to optimize the rate of participation? For example, Dropbox has a very simple referral program page, that states what the user is supposed to do to win, and how to go about it. The sharing rate is defined as how many times and by how many people is the referral link shared on different digital channels. Usually, businesses provide each participant with a custom URL so they can track how many referrals an individual is able to generate and reward him accordingly. How to optimize the rate of sharing? For example, Faballey promotes its referral offer on its homepage so that none of its website visitors miss the campaign. The referral link open rate refers to the percentage of click throughs you get to your website when people share your referral campaign. How to optimize the referral link open rate? The number of conversions you have achieved via the referral campaign. This also helps you gauge the acquisition cost per customer for the campaign. Now the number of conversions you get will depend on all the above numbers and the effective of the sales cycle. While you need to think through a referral program before actually running it, it is also important that you test out small variations. But remember, the variations shouldn’t cause any kind of dispute in your target audience. For example, if you are offering $50 off for 5 referrals, stick to the offer. You could instead vary your messaging tone and type of CTA, letting the referral offer remain the same. And most importantly, understand what your target audience is seeking for on your website. A referral campaign around a popular demand, is automatically more effective. Have you tried running a referral campaign on your eCommerce site? Do let us know if you think it is an effective way of increasing sales, in the comment section below! Basically, if you need to improve the conversions through referral activity. You need to target your customers to refer their friends, so in this scenario your customers are the most trusted audience because they have already tried your product and they can give some genuine interested referrals. Even dropbox have choose their audience to improve the audience base. As per research, e-commerce websites are using such strategies to increase their customer base. I recommend every B2C companies to start applying such strategies to improve their engagement quality with their customers and generate a new referral source/channel to drive conversions. We totally second you here! The referral marketing is all about the participation and sharing. Mouth publicity also matters allot in this case. The four points explained above are very essential for getting referral business. Thanks for enlighten on such interesting topics.